Ashok Dunda Bhalerao from Nashik, BVSC Graduate. Ashok Dunda Bhalerao is Veterinary Doctor and currently have no work experience. are one of expert skill area's of Ashok Dunda Bhalerao . 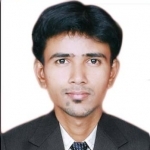 Ashok Dunda Bhalerao is working in Doctors/Nurses/Medical Professional industry.